Particularly during the high seasons, the availability of space in airfreight has been a problem for Ecuadorian growers for several years now. Sea transport is a good alternative, but without vacuum cooling the flowers, the longer transit time affects the quality. 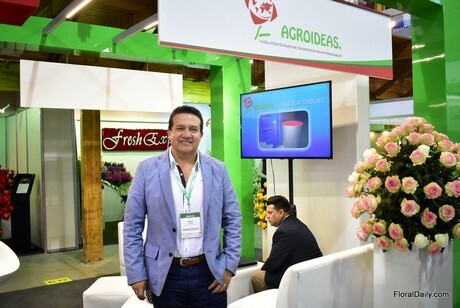 After recognizing this trend and the needs, Ecuadorian company Agroideas Cia established the first - and still the only - vacuum cooling machine in Ecuador. And it seemed to be a good move. Over the years, the acceptance of their service has grown 200% per year. "This service will not replace air transport, but it will regulate the air space problems that Ecuadorian growers and international buyers are encountering", says Juan Yazbek, manager of the company. Juan Yazbek at the Agriflor 2018 in Quito, Ecuador. According to Yazbek, sea transport entails many advantages. "Among the many, the following stand out the most: First of all, a container can carry between 9.5 to 12 tons of flowers for the same cost. Secondly, there are no rate increases during high demand seasons, no temperature variations during transport, and no damage to the products due to transportation. On top of that, it is a more economic way of transportation, and the vase life is the same as that air transport. Last but not least, in high seasons, there is still space to transport large quantities. But of course, Yazbek can also mention some disadvantages. "For this type of transport, some products are not recommended. Besides that, the transit time is longer and it departs only once a week." See Agroideas' process in this video. "In the Netherlands for example, they have been using vacuum cooling machines for many years, used to cool the flowers that come from South America, Africa, the Middle East and other latitudes of the world, with positive results, this being an indispensable process to maintain the quality of the flowers after the temperature variations during their trip, and then being loaded on trucks where they will travel for 4 days to Russia, and 3 or 2 days for other destinations. In case of shipments by refrigerated containers - once the process is completely vacuum cooled and placed in the container till it opens its doors in the client's warehouse - the flowers can travel 6 to 10 days at the same temperature. This is why the comparison of durability of flowers with air transport are the same." Agroideas vacuum cooling machine, has matured and been tested by the market. "It has been highly recognized by its users and it also makes a significant contribution to the development of the Ecuadorian floriculture industry."